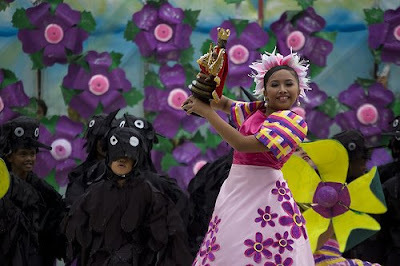 This was the first prize winner of Sinulog '08 Dance Festival. See how others see shape of "purple", visit PhotoHunt's HQ! I shoulda come over and danced! I absolutely LOVE this photo! Something about it just makes me so happy. Love the colors and the subject matter and the costumes...GREAT! And the purple flowers! Thanks for visiting mine and happy weekend! Lovely shot. The costumes and all the beautiful colors are wonderful. I think this is the most unique photo on the theme of purple that I have seen. Excellent! This must have been a wonderful, lovely event.. such color! Great job! My purple is here. Congrats on the win-worthy of it! Opps-I guess you mean the dancer was the winner-but you deserve a prize too! Wow congrats on the winner! This is a nice purpole entry...lovely purple flowers. its a great shot and the lady worn a nice costume. no wonder they won! Great shot. What a wonderful costume! this is nice. the girl looks like she is having fun dancing.